Eridani Town is not remarkable in and of itself, but rather because of a couple of its buildings. The Governor's Palace is a design by Alexander Northton from before he became famous. It's his first post graduate project and the soaring thousand foot arches win him immediate fame for his vision. The other is the Rigellan Embassy, constructed by the Rigels. It's a thin spire a mile high and wider at the top that at the bottom. The whole structure rests on a crystal sphere one inch in diameter and is a masterpiece of forced gravity technology and glass sculpture. A wide spiral staircase winds one hundred feet into the air to where the structure is finally wide enough to admit people. 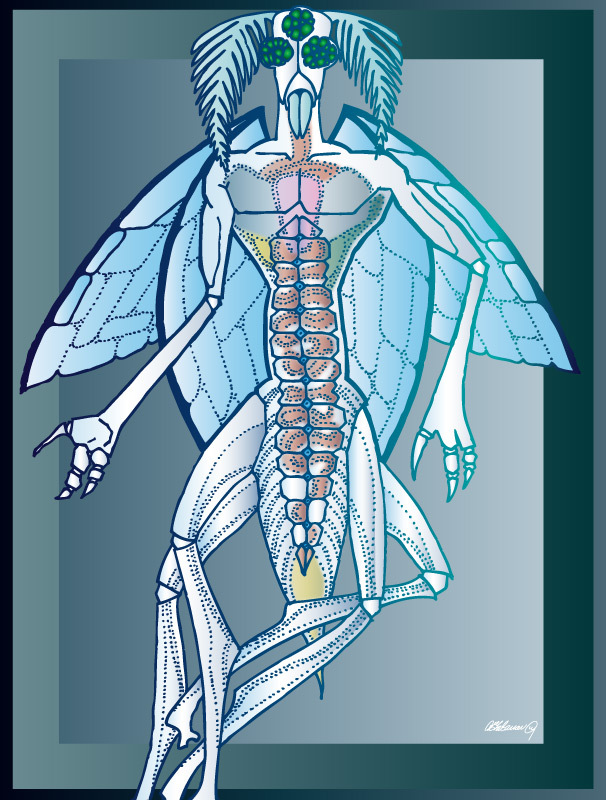 The Rigels are tall, spidery beings with a glasslike exoskeleton and translucent organs so artfully arranged that one can't help but admire them. Humans generally find Rigellan architecture beautiful but claustrophobic, somethin the Rigels simply refuse to understand. It could be because their homeworld's population numbers near twenty-two billion. This drawing was done somewhere around 1995 for my third Lightspeed Mary story. The Rigels have nothing to do with the rest of the story at all. 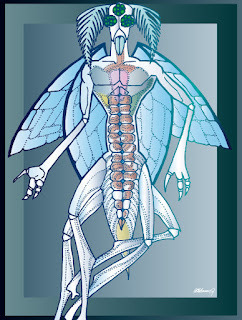 To color this drawing, I had to create all of the internal organs and the details in the limbs in Illustrator. Then I spent a huge amount of time futzing with the black border trying to make it light enough to suggest transparency without making it so light that the the figure vanished entirely. I finally cloned the border, added a gradient to one copy and made the black transparent enough to take the edge off the very bold gradient I selected.